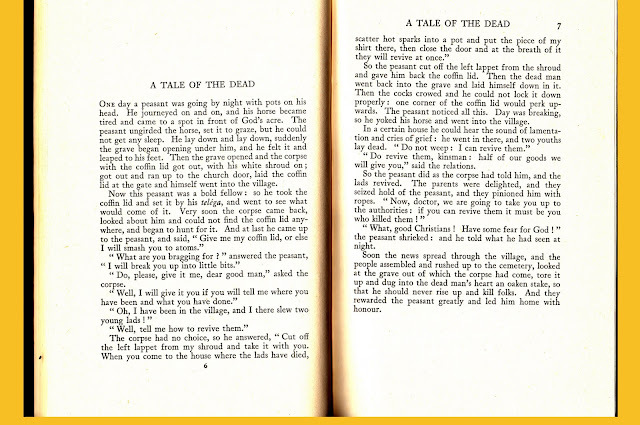 A favorite spooky tale is the Irish story of "Mary Culhane and the Dead Man" which can be found online at the late great storyteller Chuck Larkin's website. Click on Stories on his sidebar and then go down to Halloween Stories to find it. In print, it's in Betsy Bang's The Goblins Giggle, and Other Stories. Imagine my delight and fascination to find this Russian version in the works of Aleksandr Afanas'ev as collected by Leonard A. Magnus in Russian Folk-Tales. Obviously the translation is stripped to its essentials. 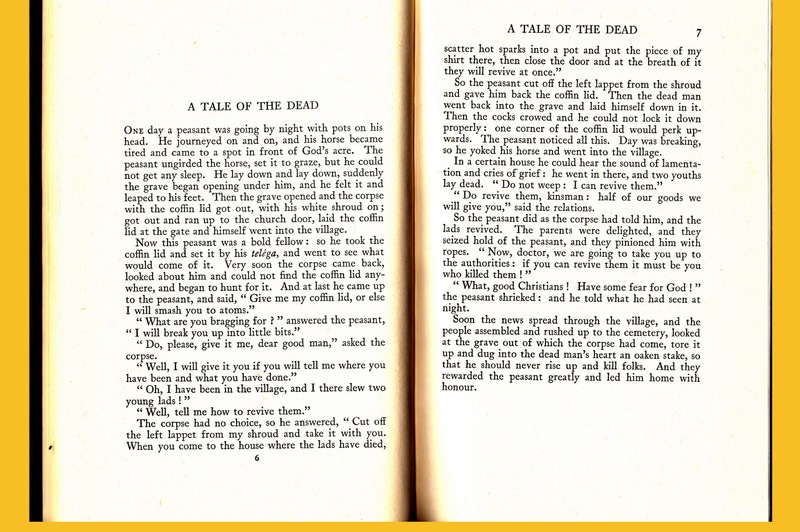 For other works of Afanas'ev there are the very tellable tales in Arthur Ransome's Old Peter's Russian Tales. In addition there's the Pantheon volume translated by Norbert Guterman, Russian Fairy Tales. According to a search I did a while back, that 1945 title is also Public Domain. Both Magnus and Guterman keep to strict translation. Much later, I want to post one of Ransome's versions. But for now, look for something by "Aunt Lulu", Louisa May Alcott, in something very different from her Little Women et al. Until then let's all be Keeping the Public in Public Domain.